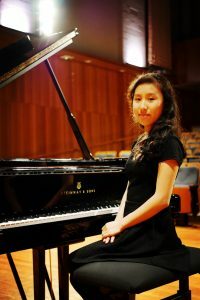 Samantha Xu began studying piano at age 5, performing at her first eisteddford in 2005. Through school years, she competed in multiple eisteddfords and performed in venues such as the Joan Sutherland Performing Arts Centre and Kogarah School of Arts, as well as charity performances in various nursing homes. She also has experience in a variety of genres of music, ranging from rock to classical to jazz, as well, as performing with other musicians. After gaining her AMusA (Associate of Music Diploma) in 2014 under Cedric Leung, and Band 6 Music 2 and E4 Music Extension (2015) under Rina Dumer, Samantha has been active in the education sphere. Aside from receiving the highly valued Great Teaching, Inspired Learning Cadetship from teach.nsw, she has wide experience in teaching piano and theoretical subjects privately. Samantha is currently studying the Bachelor of Music Education at the Sydney Conservatorium of music, majoring in Piano Performance. She is studying Pianoforte under Natalia Ricci, and Accompaniment under David Howie. All individuals have a natural curiosity and desire to learn. A love of music is also universal. Connecting with this innate joy of music and enhancing it through development of skill, musicality and understanding fills the soul with patience, understanding, empathy and compassion. This makes studying music a joyous and enriching experience. With a good teacher and willing student, music becomes a second language that conveys more than words ever can.